I found this recipe on the most excellent An Edible Mosaic blog, where everything is tried and true. Indeed, the flavors in this speak chicken satay, and it looked immediately adaptable to a nondairy format for my liking. This was a winner on every count. In a large pot, heat the oil over medium-high heat; add the chicken and cook until you don’t see any more pink. Add the garlic, ginger, and pepper flakes, and saute 2 minutes. Add the onion, carrot, celery, pumpkin, mango nectar, lemon juice, peanut butter, chicken stock, and 2 cups of water. Cover the pot and bring it up to a simmer; then turn the heat down and let it simmer about 30 minutes (stirring occasionally), until the veggies are tender and the chicken is cooked through. Dissolve the cornstarch in the creamer. Stir the vinegar into the stew, then stir in the creamer mixture; simmer uncovered about 5 minutes, until the stew is thickened. Turn off the heat and stir in the parsley or cilantro. Season to taste with salt and pepper. 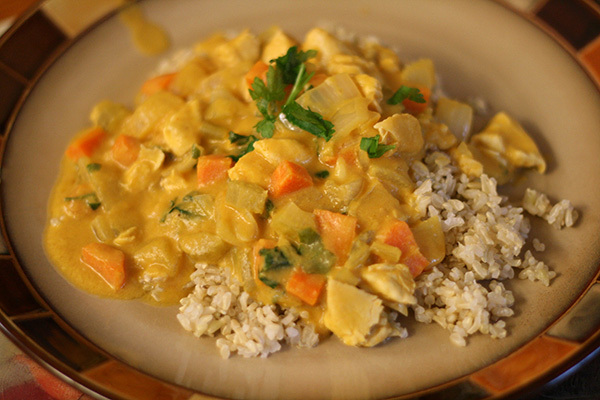 Serve with jasmine rice, if desired. Makes 6 – 8 servings. 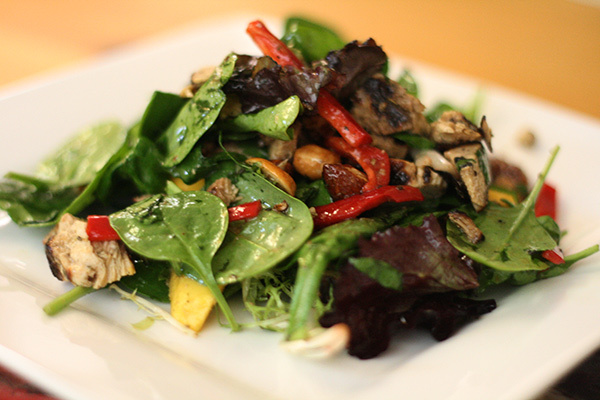 A quick and fabulous salad for summer days and after work specials. Comes together easily. All the flavors seemed to complement each other. Shout out to Chaos in the Kitchen. 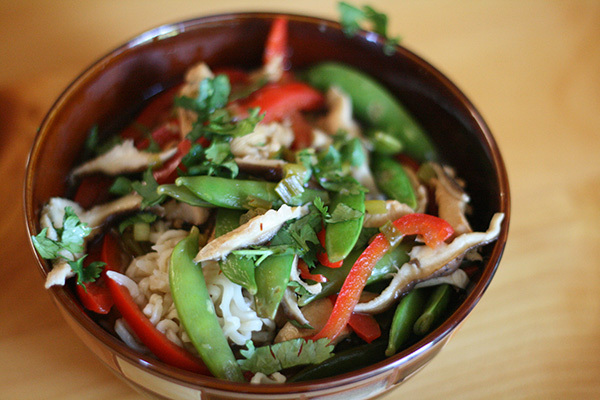 Mix dressing, cilantro, and ginger in a small bowl. Let stand. 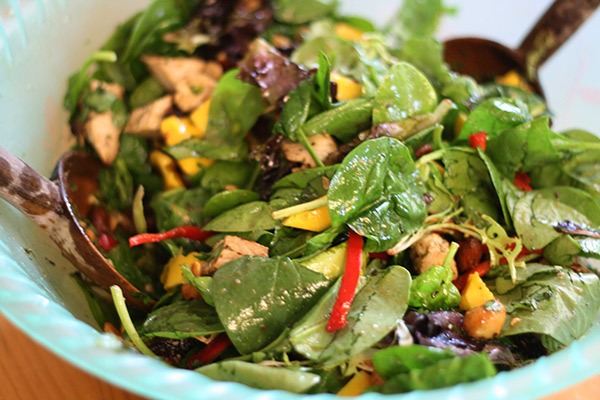 Toss salad greens with peppers, onions, chicken, and peanuts. Dress salad to taste and toss to combine. Add mango and serve. Makes 6 servings. Combine all ingredients in a small jar. Shake to combine. This dish has all my favorite Chinese flavors. I used a spicy soy sausage instead of the real thing, and thought it added a great zing. 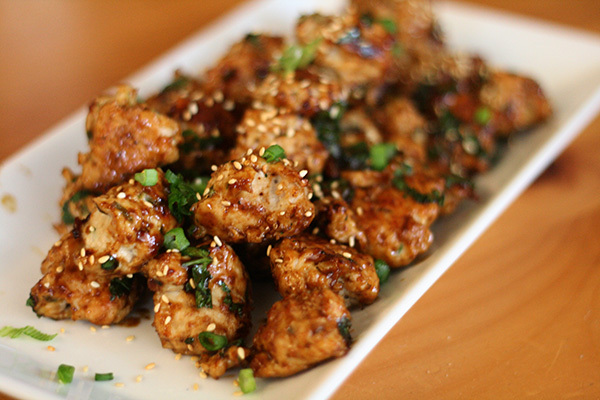 Heat the oven to 350 degrees F. Whisk together the soy sauce, sugar, sesame oil, and cornstarch in a medium bowl. Stir in the chicken, scallions, garlic, and ginger, and toss so that they are coated with the liquid. Place this mixture in the refrigerator and let marinate for at least 15 minutes while you cook the mushrooms. Place a 3-quart Dutch oven over medium high heat on the stove. When it is hot, add the sausage and brown. Add the mushrooms. Let the mushrooms cook, without stirring them, for 5 minutes, then flip them over and cook for another 3 minutes. Add 1 tablespoon oil to the pot, and saute the rice briefly to develop some toasty flavor, then add the salt and the chicken mixture from the fridge. Pour in the stock. Bring to a boil. Turn off the heat, cover with a lid and bake for 45 minutes. Make sure to taste the rice for doneness before taking it out of the oven. Let stand 5 minutes, covered, before serving. 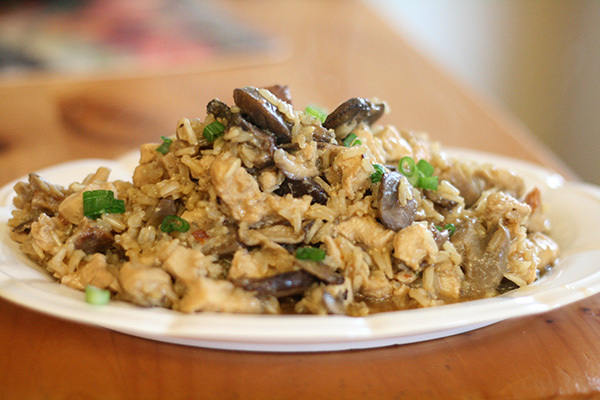 Stir up the rice before serving, as the chicken and mushrooms will have risen to the top during the baking. Garnish with chopped scallions. Makes 6 servings. These are tasty little cocktail meatballs, but we had then as a main course with rice and roasted veggies on the side. Easy to make, and they go down easy, too. Whisk soy sauce, sesame oil, ginger, crushed pepper, and sugar in a large bowl. Whisk in cornstarch until smooth. Stir in 2 minced scallions and the water chestnuts. Stir in turkey until completely combined. Drop turkey mixture by rounded tablespoons onto the prepared baking sheet, gently re-shaping into ball shapes if necessary. Lightly coat the balls with cooking spray and transfer to the oven. Bake until the meat is cooked through, 15 – 17 minutes. Stir the Hoisin sauce, cilantro, and lime juice in a large bowl. Add the cooked meatballs and gently stir to coat. Sprinkle with the remaining sliced scallions and sesame seeds and serve hot. Makes about 2 dozen meatballs. Mmmm – so good, healthy, delicious. The tofu in the filling caught my eye. The teriyaki sauce is just excellent. 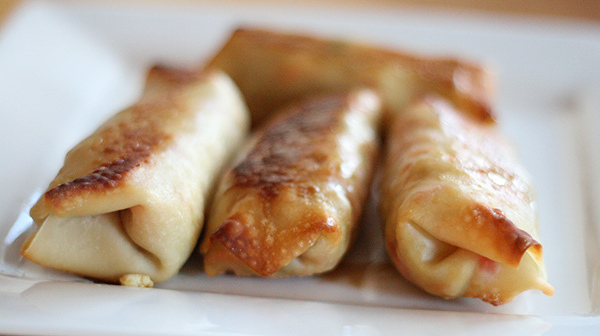 All the goodness of eggrolls, none of the grease. For the teriyaki sauce: heat a small pan on low and add the olive oil, garlic, and ginger; saute for 1 – 2 minutes or until fragrant. Add the soy sauce, vinegar, water, honey, and pepper, then turn the heat up to medium-high; bring this to a boil and then add the dissolved cornstarch. Once the cornstarch slurry is added, boil for ~1 minute (the mixture will be thickened) and shut off the heat. Slice the tofu, layer it between paper towels, and gently press down to extract the moisture. Crumble the tofu into a medium-sized pan, add 2 tablespoons teriyaki sauce, and saute on medium heat for ~ 5 minutes. Add the cabbage, carrots, red pepper, and chives, along with 1 more tablespoon teriyaki sauce, and saute for ~ 2 minutes more, til veggies are slightly wilted. Allow the mixture to cool slightly. 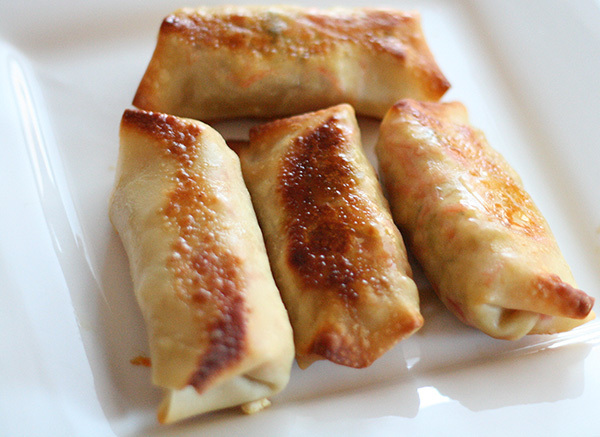 To make the eggroll, place 1 eggroll skin in front of you with one corner pointing down, in a diamond shape. 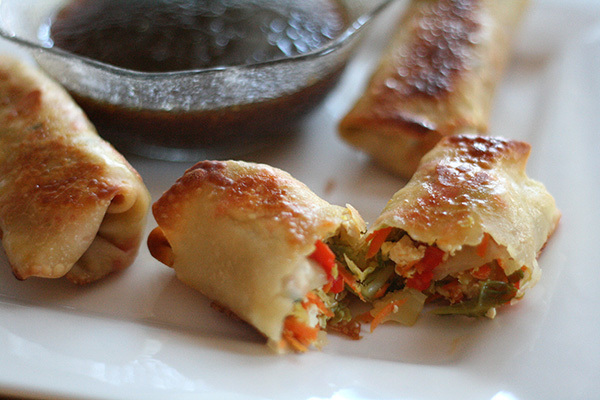 Slightly toward the lower half of the eggroll skin, place ~ 3 tablespoons of the tofu/veggie filling. Wrap the bottom point up over the filling, then wrap the sides in. Securely, but gently, roll the eggroll up; just before you finish rolling, lightly brush the top point of the eggroll skin with the eggwash. Lightly spray a baking sheet with cooking spray, line the eggrolls ~1 inch apart on the baking sheet and lightly spray each eggroll with cooking spray. Bake for 8 – 10 minutes (or until golden on the bottom), then flip and bake 6 – 9 minutes (or until golden on the second side). Serve with the remaining teriyaki sauce for dipping. This made 16 eggrolls for me. 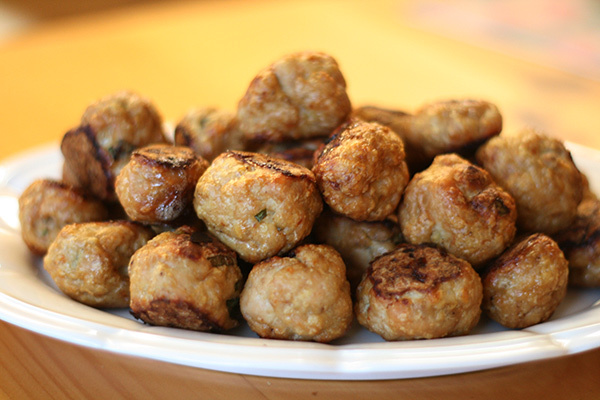 These scrumptious little morsels are good for appetizers or a main dish. 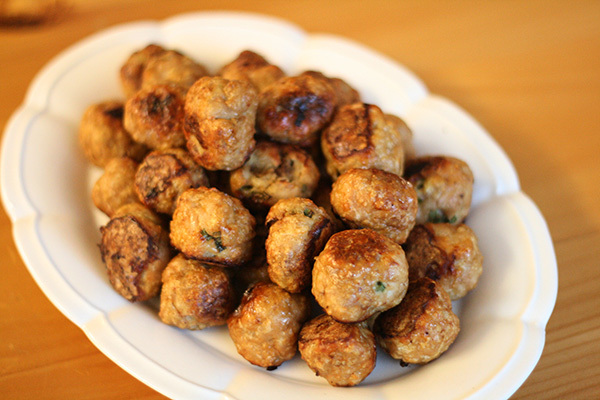 The Asian twist to them makes this a welcome change to most of the meatballs that I am used to. I served this with a soy dipping sauce and they magically disappeared. Preheat oven to 400 degrees F. Slice the green onions. In a large bowl, place the turkey (or chicken). Add the 5-spice powder, soy sauce, and chili sauce. Add the egg and breadcrumbs and mix everything together. Roll the mixture into desired sized meatballs. Bake on a pre-sprayed baking sheet until golden for about 30 minutes.